Jagged 14k white gold ring with Australian semi-black opal and diamond accents. Green semi-black opal with green and red pin-fire flashing below set in a jagged styled ring with diamonds. A great gift for that special someone who loves green. Size: 6.00 Please call if you have any questions about resizing. 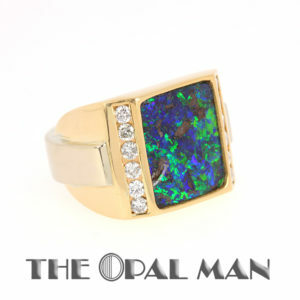 Sold – Boulder Matrix Opal Ring in 14K Gold. 12 Bright Diamonds. Wow Factor.